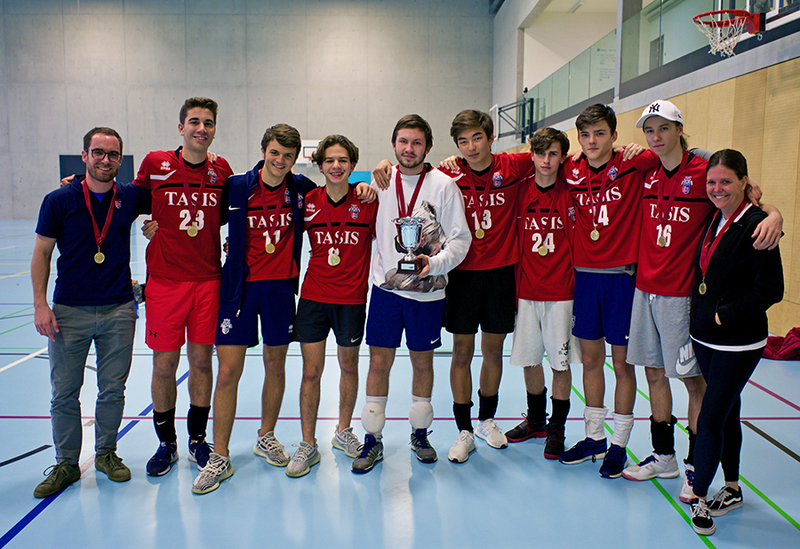 The Varsity Boys Volleyball team traveled to the International School of Zug and Luzern (ISZL) on the morning of Friday, November 9, for the annual European Sports Conference (ESC) Championships, a two-day tournament featuring six teams from four different countries. As the defending champions, the Tigers had high expectations but knew they would need to play consistently well against a range of strong opponents with different styles of play to bring home another 1st-place trophy. In the first game of pool play on Friday, the Tigers lost a close match against the talented 5-man squad from International School of Lausanne (ISL). Two of the sets went to extra points, but TASIS did not appear to be fully awake, and poor passing allowed ISL to get the advantage and win the three-set match 26-24, 17-25, 24-26. Thankfully, TASIS was able to bounce back in the second match of the day against the hosts, ISZL. With a large crowd in attendance, the Tigers took the momentum early on and dominated the net, led by captain Nadir Timerbaev '19 (3 aces, 4 kills), Ivan Linnikov '22 (2 aces, 4 kills), and Ivan Kozhuhar '21 (1 ace, 5 kills). Although they lost a close three-set match to the Eagles earlier in the season, the Tigers locked in their first win of the tournament with a convincing 2-0 victory (25-18, 25-18). In the third match of pool play, TASIS faced a familiar opponent in the American School of Milan (ASM). The Tigers showed how much they have improved over the season by passing very well against strong servers from Milan who had frustrated them earlier in the season. With good passing, TASIS was able to use their offensive strength to notch another two-set match (25-15, 25-15). After finishing with two wins and one loss in pool play on Friday, TASIS was tied for second place with St. Julian’s School. Given the configuration of the tournament, they would need to win their last two pool-play matches on Saturday morning to guarantee a second-place finish and an opportunity to play in the final. Saturday morning, TASIS faced BBIS for their fourth match in the pool. Unexpectedly, BBIS started off strong and made the match much closer than expected. With an impressive display of passing and hitting, BBIS took TASIS by surprise and won the first set 22-25. After falling behind in the second set and facing the possibility of missing the championship game, the Tigers finally woke up and started playing their game. Led by setter Josh Galmarini '20 (4 aces), Timerbaev (2 aces, 7 kills), and Linnikov (2 aces, 4 kills), TASIS retook the lead and evened up the match with a 25-18 win in the second set. Continuing their momentum into the third set, TASIS shut down the hitters from BBIS and took the match with a 25-15 finish. For their last match of pool play, TASIS would have to beat St. Julian’s School from Lisbon to have a chance at second place in the pool. As both teams had only one loss, this match would decide who would play ISL for the championship. Coming off a long game with ISZL, St. Julian’s struggled at the net, and TASIS capitalized on their considerable height advantage to pound St. Julian’s with spikes and strong serves. A match that was expected to be a long defensive battle turned into a lobsided two-set victory for TASIS: 25-12, 25-15. By clinching their spot in the final, TASIS would have one more chance to take on ISL in a repeat of the dramatic ESC final from the year before. Having already lost twice to ISL this season, the Tigers knew they would have to play their best to control the net and avoid errors against the more experienced players from ISL. With accurate passes and nearly flawless spiking, TASIS surprised ISL and took the first set 25-20. The Wolves would not give up easily, however, and came out strong in the second set. Employing their sophisticated offensive plays, ISL took an early lead and looked like they might even up the match and force a third set. Down 11-19 and realizing that the set was slipping away, TASIS started to claw its way back. A spectacular serving run from Galmarini brought the Tigers back from 15-22 to tie up the match at 22. After a few more back-and-forth points, Timerbaev, who was named to the tournament All-Star Team, sealed the match with a fantastic spike from the back row to deliver TASIS a 26-24 win. The victory gave TASIS its second consecutive ESC title and fourth in five years. With just three players returning from last year’s solid squad, it’s fair to say that the Tigers, who have now posted 14 wins against just five losses, have greatly exceeded expectations.